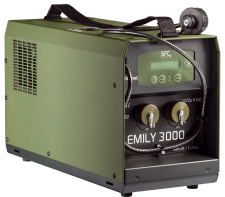 The EMILY 3000 fuel cell by SFC Energy AG is the power generator on board of Polaris Defense’s modified MRZR-D4 high mobility tactical vehicle. As demonstrated during the recent DSEI exhibition in London, the MRZR-D4 is an ultra-light tactical vehicle developed by Polaris Defense for the demanding mobility needs of international special operations, expeditionary and light infantry forces in off-road missions and emerging threats. Brunnthal/Munich, Germany, November 2, 2017 – The EMILY 3000 fuel cell by SFC Energy AG (F3C:DE, ISIN: DE0007568578), a leading provider of hybrid power solutions to the stationary and mobile power generation markets, is the power generator on board of Polaris Defense’s modified MRZR-D4 high mobility tactical vehicle. As demonstrated during the recent DSEI exhibition in London, the MRZR-D4 is an ultra-light tactical vehicle developed by Polaris Defense for the demanding mobility needs of international special operations, expeditionary and light infantry forces in off-road missions and emerging threats. On board of the MRZR-D4 an EMILY 3000 fuel cell provides sustainable, reliable tactical power for extended mobility and enhanced mission endurance. Numerous international NATO and global defense organizations use SFC Energy fuel cell products. SFC fuel cell and accessory products carry a NATO stock number codification and are approved for air transportation according to UN3473.